Here’s an efficient system for heating new oak flooring. Installing an electric floor heating system under a hardwood floor is a great way to add warmth and comfort to any room. It’s also a fairly simple process because there are no vents, ducts, pipes or radiators involved. I like using electric radiant heat because, simply put, it heats really well. A radiant heat system heats the entire room from the floor up, resulting in heat that is consistent throughout the room. The heat produced by the system also reduces humidity and draftiness, which results in fewer dust mites and allergens in the air. On one recent remodel, I was updating an unheated four-season porch with three exterior walls, a roof above, and a crawlspace beneath. The client had their HVAC contractor try to access the porch for heat, but all they were able to do was split an existing heating duct to get some heat into the porch. Unfortunately this was not enough, and the porch was still cold. They turned to me for help. We chose to use the Warmup Inc. “Loose Wire Heating System” (NADWS) paired with the company’s new programmable 4iE thermostat. Using the Warmup system, we were able to offer our clients the ability to continue their hardwood flooring into the adjacent porch, and add heating comfort. The result was a luxurious warm floor, and the benefit of a maintenance-free heating system completely hidden under the hardwoods. After addressing moisture issues in the crawlspace beneath the floor, the next order of business was to prep the subfloor. To raise the height of the new finished floor to match an adjacent room, we installed a layer 1/2″ CDX plywood followed by 1/4″ sleepers. Radiant heat, whether water-based or electric, does not affect wood floors. Only moisture can negatively impact wood and cause it to contract, resulting in floor cracks. Temperature has little impact on wood floors; it is therefore completely safe to use radiant heat with wood. It is common to confuse the effects of moisture and temperature on wood. Temperature only has an impact at very high levels, while even moderate amounts of moisture can hurt a wood floor. The layout plan provided by the heat-system manufacturer will help guide placement of the sleepers. Because the porch was built over a dirt floor and adding a concrete subfloor was not in the budget, we knew we would have to control for moisture. So the first thing we did was close the crawlspace vents and apply closed-cell spray to the underside of the floor system. Many crawlspace floor joists are insulated with fiberglass batt insulation, which tends to absorb moisture and also can fall out if not properly installed. Insulating the perimeter walls is one way to avoid this. Another option is our method filling the entire floor joist bay and encapsulating the floor joist system (sills, rim joists and joists) with closed-cell, spray foam insulation. We decided to use 1/4″ plywood ripped to 3″ strips for the sleepers. The next step was to cover the floor with a crawlspace liner and open the crawlspace to the basement, which is HVAC conditioned. The goal was to build a sealed, conditioned crawlspace that would avoid condensation during humid seasonal conditions. Once we were satisfied that we’d addressed those moisture issues, we added the electric radiant heat system. Note: With a non-insulated crawlspace under the plywood, you should use insulation boards prior to installing the heating coils. In our four-season porch, we decided to install 3/4-in. oak hardwood flooring to match the rest of the house flooring, but we had some floor height issues to deal with first. The porch floor was 1-1/2 inches lower than the finished hardwood floor height of the main house. We wanted the new heated hardwood floor to be seamless, and the same height as the main house. 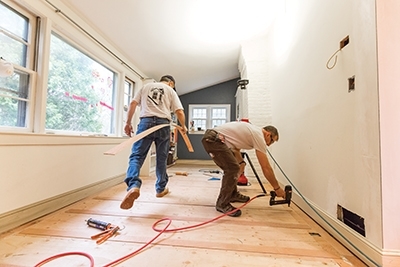 Plan the installation as you would any standard flooring job by snapping lines to guide board placement and accounting for out-of-square walls. In order to get our new porch floor the same height as the existing house floor, we had to add plywood to the porch floor. We screwed down a layer of 1/2-in. CDX plywood to raise the floor and then installed 1/4-in. 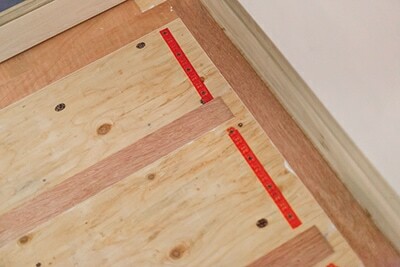 plywood nailer strips (called “sleepers”) along the perimeter of the room and at 16-in. intervals to get to a total 3/4-in. height. The radiant heating cable measures 1/8 in. so we decided to use 1/4-in. plywood ripped to 3 inches for the sleepers. The sleeper strips create lanes into which the heating cable will be placed. 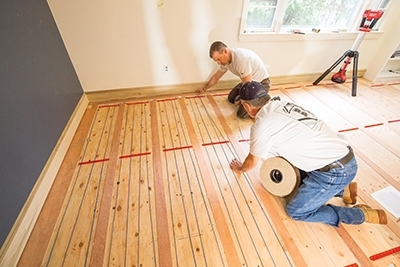 Sleeper strips create lanes into which the heating cable will be placed and should be installed perpendicular to the hardwood flooring to be fastened into the sleeper. Apply construction adhesive to the bottoms of the sleepers. Using 3-in. wide sleepers allowed us to space out sleepers to the standard 16-in. on-center spacing. This spacing creates a 10-in. wide space to run three loops of radiant cable spaced 3 inches apart. Nail the sleepers throughout their length, using two nails at each end. The sleepers were spaced 16″ on-center, which creates a 10″ wide space between them to run three loops of radiant cable spaced 3″ apart. 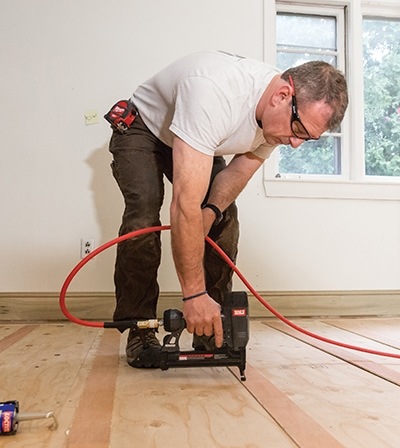 Several flooring manufacturers have tested their products specifically with Warmup products and certified their warranties on combined installations. This list includes Amorim, Wicanders, and Higuera Hardwoods, among others. 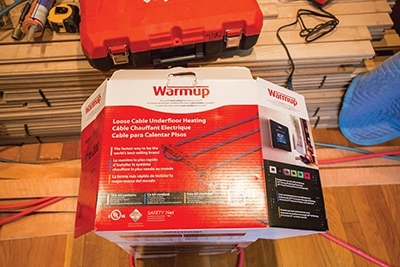 The Warmup kit includes all components needed for its Loose Cable Underfloor Heating. Use 1/4-in. or 3/8-in. sleepers so that filling the voids with leveler will give you an effective heat bank, yet only minimally raise floors. Using the standard 10-in. spacing for 3-in. wide sleeper runs, we spaced three runs of cable (spaced at 2”, 5” and 8”) in each sleeper gap. First step is installation of Warmup’s fixing strips. Note: Depending on your specific conditions, you may need to adjust sleeper spacing to accommodate the support of the wood floor. For installations over concrete and/or requiring insulation, a variant of the sleeper method is to use 2×3’s or 2×4’s partly embedded in the slab pour. This allows for insulation to be included and more thermal mass to be poured between the sleepers. Warmup’s regular NADWS floor heating or WODH slab heating cables can be used in these applications. Lace the heating cable on the fixing strip. Once the cables are in, pour concrete between the sleepers. This creates a thin radiant slab that encases the cables. In all cases, a layer of insulation is normally placed below the existing subfloor to ensure that most of the heat is directed upward. Run the heating cable back and forth in parallel to the wood sleepers until all the sections are filled. I used latex-modified thinset (LMT), which is a blend of cement, very finely graded sand, and a water-retention compound that allows the cement to properly hydrate. 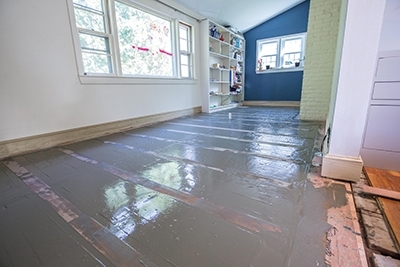 LMT is cheaper than a self-leveling pour, which is frankly not needed in this situation. Durable and resistant to cracking. Priming the subfloor is not needed. 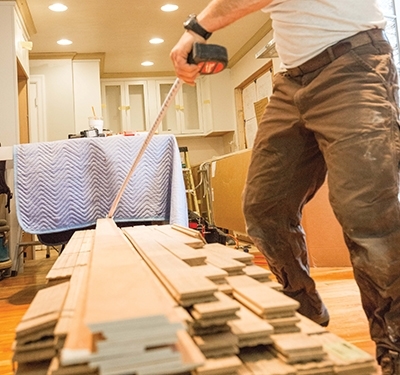 Extensive laboratory testing by Launstein Hardwood Floors in Mason, Mich., found that American hardwoods—including cherry, oak, ash, maple, hickory and walnut—are good choices for radiant-heat flooring. Beech, Australian cypress, and many bamboo products are examples of those that are not. 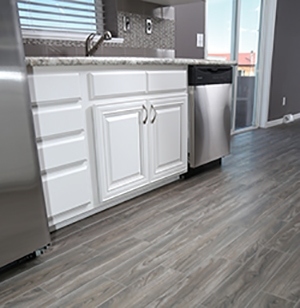 We wanted to purchase and install a material that would not only match the existing oak strip flooring, but be dimensionally more stable with the added floor heat. It’s natural for all floors to shrink and swell, depending on the season, so we chose rift and quartered oak which is touted as approximately 30 percent more stable than plainsawn oak flooring. Rift and quartered boards rival engineered flooring. These boards will only expand or shrink in thickness (height) and will remain stable from side-to-side (width). They are perhaps the best option for hardwood radiant heated floors, and also an excellent choice to minimize seasonal gaps, buckling, and so on. For best results, use narrow boards, preferably not wider than 3 inches. 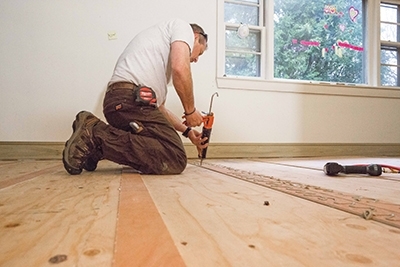 Narrow boards will better accommodate wood’s natural expansion and contraction across a floor. 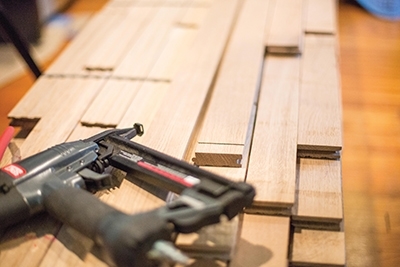 Use quarter-sawn wood for planks wider than 3 inches, for better dimensional stability. Acclimate your wood floor: Wood naturally expands and contracts to reach balance with the relative humidity of its surroundings. 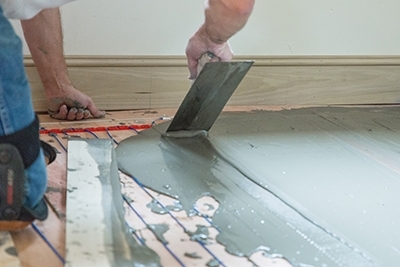 Avoid installing wood flooring when moisture levels are high, such as during painting or the installation of plaster. Before hardwood floor installation, operate the heating system until the relative temperature and humidity in the space stabilizes to the average level expected for seasonal conditions in the area in which the wood floor will be installed.Ensure your flooring’s moisture content is appropriate for your area. Typically, a 6- to 8-percent moisture content is average. Engineered floors are inherently more stable. Reclaimed woods typically have tighter growth rings (since the wood is more likely to be old-growth) making them denser and more stable. Parquet: Overall, parquet floors have less expansion and contraction. 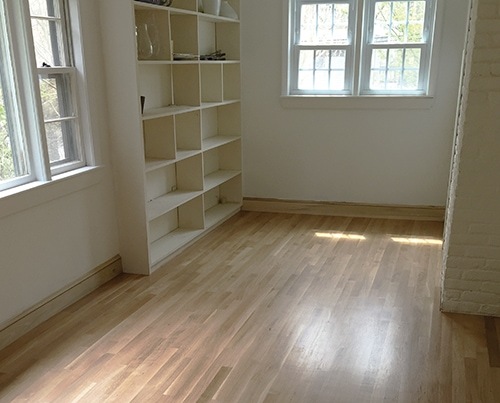 Dark floors: Their color makes gaps between boards less obvious. Flooring with beveled edges make any gaps less obvious. First, deliver the flooring about 1.5 weeks early to let it acclimate to the conditions in the house. 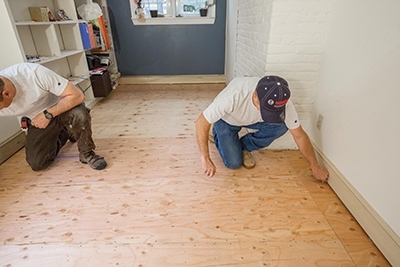 Install the boards the same as you would without radiant heat; all the precautions recommended for strip flooring apply. 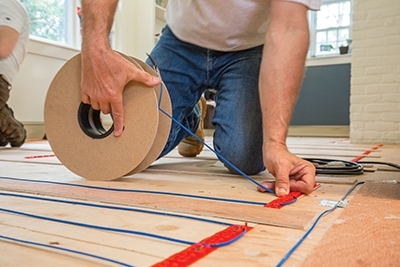 When installing over radiant heating cables, you need to slow down and be precise in placing the fasteners. We nailed the sleepers along the length of the strips and used a minimum of two fasteners at each end. Step 1: Determine the heated area. Measure the room that will be receiving radiant heat. Make a sketch or drawing and send it to Warmup for a quote. Determine your thermostat location and note it on your sketch. We used latex-modified thinset (LMT) to encapsulate the heating wires. Step 2: Locate the thermostat. Warmup electric radiant heat mat systems are designed to be used with a UL Certified programmable thermostat. Locate your thermostat approximately 5 feet off floor and always on an inside wall. Try to avoid placing it near heat sources, excessive sunlight from windows, or skylights. The Warmup proprietary 3iE and 4iE thermostats include the safety of upper-limit temperature monitoring. This means that when selecting “wood floors” in the programming, the heat settings will never rise past 82F and ensure smooth and gradual heating of the floors. Spread the level the thinset to the top of the sleepers. Step 3: Run a 20-amp, GFCI protected circuit. Run a dedicated 20-amp GFCI circuit to your thermostat location. Prior to closing up any walls, I install a wire pull string from the thermostat box, down the wall cavity, and through a notched section of the 2×4 wall shoe plate. After the wallboard is installed the string will be used to pull the cold lead and floor sensor wire up the wall to the thermostat location. 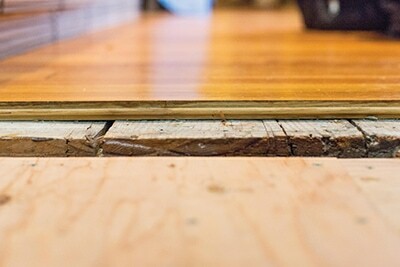 When the leveling compound has cured, install the hardwood flooring according to standard procedures. Step 4: Install wood sleepers. Using wood strips 1/4- to 3/4-in. thick and 2 inches wide, install strips at 12- to 16-in. intervals when using the Warmup system. Leave a 2-in. gap at alternate ends of the strips for heating wires to cross from one section to the next. We chose rift and quartered boards for the flooring. They’re a good option for hardwood radiant heated floors and they also minimize seasonal gaps, buckling, and so on. Step 5: Install the fixing strips. 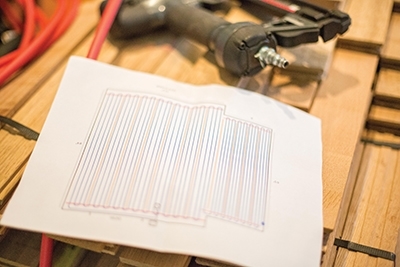 Use hot glue, nails or screws to secure the strips to the floor with a minimum 3-in. distance from the walls and permanent fixtures. Step 6: Install the heating system. 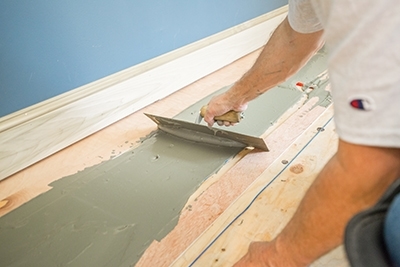 Starting at the closest point on the floor to the thermostat, tape the joint to the subfloor. Lace the heating cable on the fixing strip and run it back and forth in parallel to the wood sleepers until all the sections are filled in. Step 7: Install the temperature sensor probe. Place the probe wire containing the capped sensor evenly between two runs of heating cables at least 12 inches from the wall into the heated area. At no time should the probe wire cross the heating cable. Step 8: Embed the heating system using leveling compound. When the heating system is completely installed, apply a mixture of modified latex thinset compound over the entire heating system. Use a scrap board to spread and level the thinset to the top of the sleepers. Leveling compounds/thin-set/adhesive MUST contain latex compounds and capable of withstanding temperatures of up to 140°F (60°C) when used with underfloor electric heat systems. Step 9: Install the hardwood flooring. When the leveling compound has cured, install the hardwood flooring by attaching it to the wood sleepers only. Use caution not to damage the wires with your fasteners. Step 10: Program the thermostat. 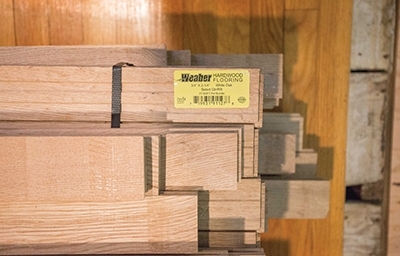 Program the thermostat to a maximum of 81°F (26.5°C) to avoid drying out the wood or causing warping. The thermostat must be regulated by a floor probe positioned between the heating cables. Note the Warmup 4IE thermostat does this automatically when selecting Wood Floors in the menu. Attach the flooring to the wood sleepers only. Use caution not to damage the wires with your fasteners. 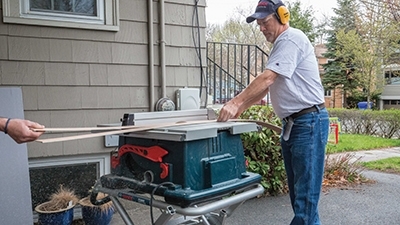 Editor’s Note: Robert Robillard is principal of a carpentry and renovation business located in Concord, Massachusetts, and editor of the blog, A Concord Carpenter, www.AConcordCarpenter.com. Since 2005, SnapStone porcelain tile floors have been cutting installation time in half, thanks to its innovative interlocking tray system. Developed in Omaha, Nebraska, this patented floating tile floor system features a real porcelain tile permanently bonded to a polymer tray that “snaps” together with the tile tray next to it, eliminating the need for messy mortar, thinset and spacers. The SnapStone installation process is as easy as Prep, Snap, Grout. After ensuring the subfloor is flat, clean and dry, SnapStone can be installed and grouted within a day. A SnapStone floor installation requires only two things: a SnapStone tile and SnapStone’s flexible urethane grout. Perfect for the both the first time DIY’er and seasoned tile contractors alike, a SnapStone floor is suitable for most rooms in the home. Matching raw tile, bullnose and nine grout colors finish off the floor and |room as well. The SnapStone system can be installed over most existing subfloors, such as vinyl, hardwood, laminate or cement. It can also be laid over plywood in a new construction. With three tile collections and nearly 50 colors, you’re sure to find a beautiful floor for your home. Visit www.snapstone.com. 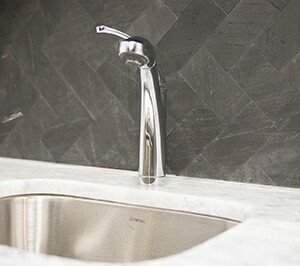 The FastStone+ product line is real stone obtained from quarries around the world and split from real slate. Each piece results in different color hues, which means the raw surface of slate and the interchanging colors of each stone layer are absolutely unique. FastStone+ consists of a thin layer of natural stone with a polyester resin with glass fiber (backing) and bonds with 3M PE foam tape peel and stick adhesive. FastStone+ tiles are easily installed using standard woodworking tools, and can be cut with hand shears, with no special stonemason skills required. It is truly the first “DIY” stone product available on the market today. The product is currently available in four colors and five tile sizes: 3″x6″, 6″x6″, 6″x9″, 12″x12″ and 12″X24″ and are sized to fit together to create unique patterns. FastStone+ offers unlimited possibilities for interior walls (flat or curved), backsplashes, feature walls, fireplace surrounds, partition walls, food service counters, furniture etc. Visit faststoneplus.com.